Kirara is the nekomata companion of Sango, the youkai exterminator that hails from a mountain village of other exterminators. 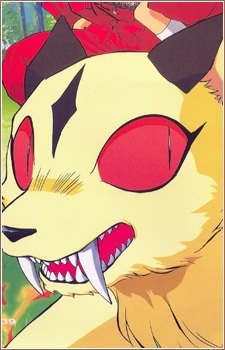 Kirara usually appears as a tiny and cute feline no larger than a kitten with cream-colored fur, black ears, various black markings, large red eyes, and two tails, but her true form is a large saber toothed tiger-like youkai. When InuYasha and his friends go to Sango's village, which was the birthplace of the Shikon Jewel, they find out that the Shikon Jewel was created when the priestess Midoriko forced her soul from her body when fighting a powerful demon. In the anime, it is then hinted that Kirara may have fought by Midoriko's side a long time ago.